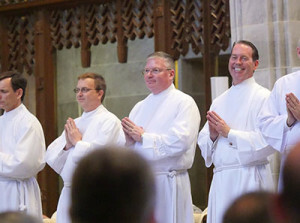 Permanent deacons at their ordination. Four information sessions have been planned. If you are still interested in becoming a deacon, please plan on attending one of these sessions. The sessions will educate you on the formation process. If after the session you are still interested, you may obtain an application from Fr. Michael Triplett, Director of Deacon Formation or one of the Formation Team Members. It is necessary for you to attend one of these sessions in order to obtain an application. Your wife is also encouraged to attend. Please RSVP to Cindy Orr in the Office of Clergy Personnel sometime before the session you wish to attend and indicate which session you will attend and if your wife will be accompanying you: corr@archbalt.org or 410-547-5550. If you are interested in finding out other information about the diaconate and diaconal requirements and formation, please contact the Office of Clergy Personnel: 410-547-5550.